DES MOINES – Dixie Wooten will be returning as Head Coach of The Iowa Barnstormers for the 2019 Indoor Football League (IFL) season, the team announced. Head Coach Dixie Wooten is returning to the Barnstormers for his third season with the team. 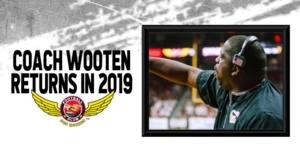 With over a dozen years of combined playing and coaching experience, Wooten took over as Head Coach for the Barnstormers in 2017 bringing a wealth of knowledge to the organization. In his first season with the team, Coach Wooten led the Barnstormers to a 13-3 regular season record making it to the playoffs for the first time since 2009. Wooten made good on his promise to keep the momentum going in 2018 as the Barnstormers finished 11-3 on the regular season. The Iowa Barnstormers clinched home playoff advantage, beating the Nebraska Danger 48-17 and moving on to the championship. The Iowa Barnstormers not only earned their place in the United Bowl Championship game, but once again earned home field advantage and came out victorious over the Sioux Falls Storm, 42-38. The 2018 United Bowl victory marked the team’s first ever Championship title. Coach Wooten’s impact was felt league-wide as he earned IFL Coach of the Year following both the 2017 and 2018 seasons. With a championship title under the Barnstormers’ belt, the pressure is on for Wooten going into his third season. With the off season just kicking off, Wooten has already begun planning for the 2019 season. “We did a great job last year on a lot of things, but as a coach there is so much I have to improve on to keep winning championships,” said Wooten. “I have to start planning early to have a great recruiting off season, have a better training camp, and to start the season off stronger. The Iowa Barnstormers will return to Des Moines to defend their championship title in February of 2019. Recruiting has begun for the 2019 season and roster announcements will be made in the coming weeks. Season Tickets for the Iowa Barnstormers 2019 season are on sale now for as low as $80 per seat. Don’t miss a minute of the action! For more information, call the Barnstormers at (515) 633-2255 or log on to www.theiowabarnstormers.com.